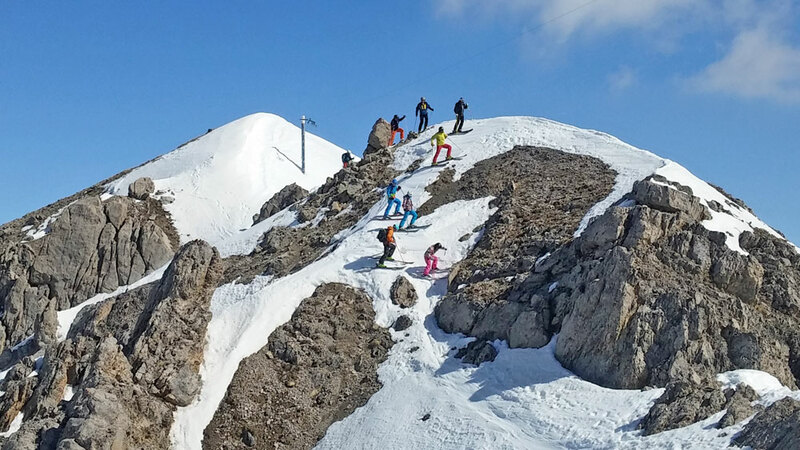 Last ski tour of the season? 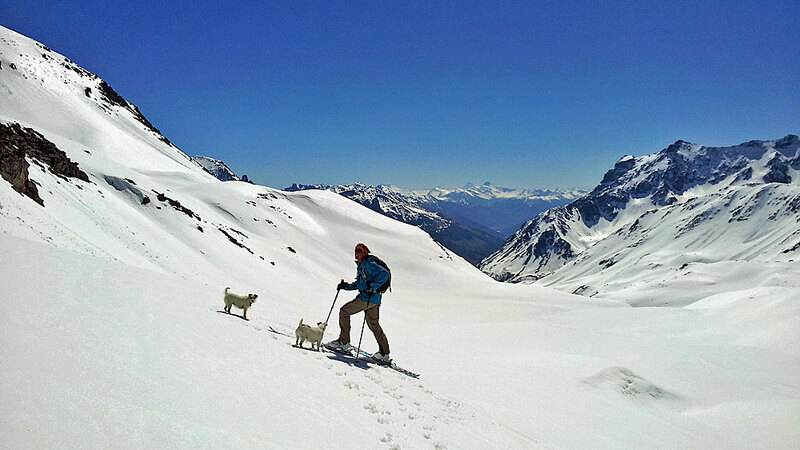 But it was a big one, Pic des Trois Evêchés - and an extreme walkies for the Rando Chiens! 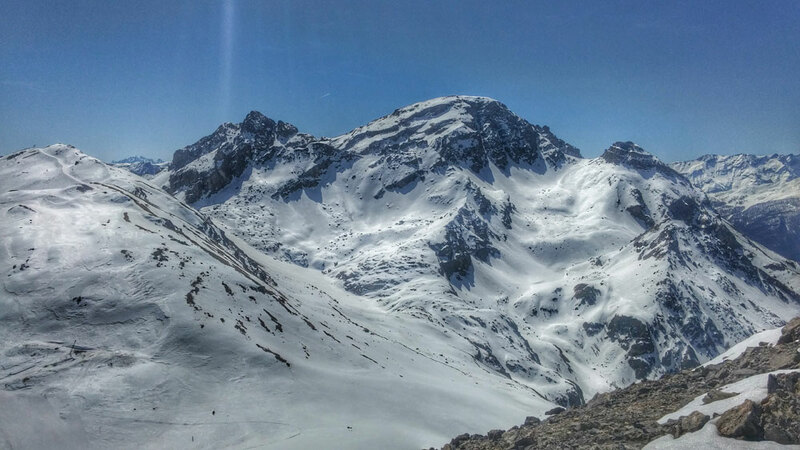 Still plenty of snow above the Col du Lautaret, but we had to leave early because of the warm spring conditions. 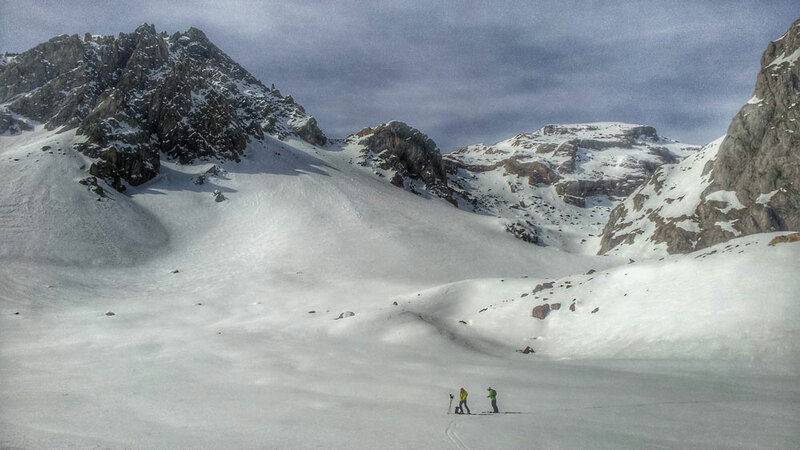 There were only a few die-hard tourers out in 'our' sector and pretty well no visible tracks above 2300m after the snow fall over the weekend. I left Elaine nursing her first blister ever in ski boots (something to do with wearing boots too loose, hot feet and a very long traverse!) 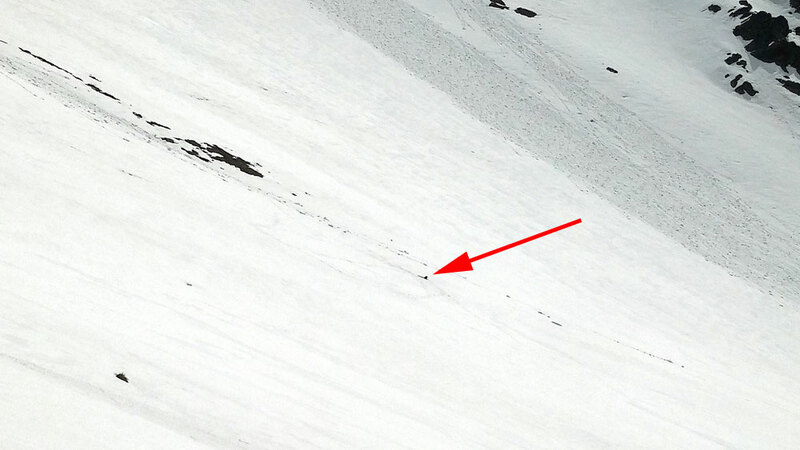 at around 2,750m and skinned up the steep slope, complete with Rando Chiens, to the ridge (3,000m), boot packing the last 75m (see distant figure and two dots to the right of Elaine's SCOTT Crus'Airs. With only about 15m to go, I called it a day as I started to sink up to my knee, and my boot was encased in snow that set like concrete. Plus with two big visible spring slides either side of me I was conscious of what might be happening to the snow. It was a sublime ski back down, waiting now and then for the Randos. But, by the end, we were having to ski over the grass and mud for the final 100m back to the van. Back home it was like summer on the patio, with Randos chillin' among the gear. Last day of the season in Serre Che so we're going for Sunday lunch up the hill. Yes, actual lunch rather than a bottle of water and piece of chocolate! 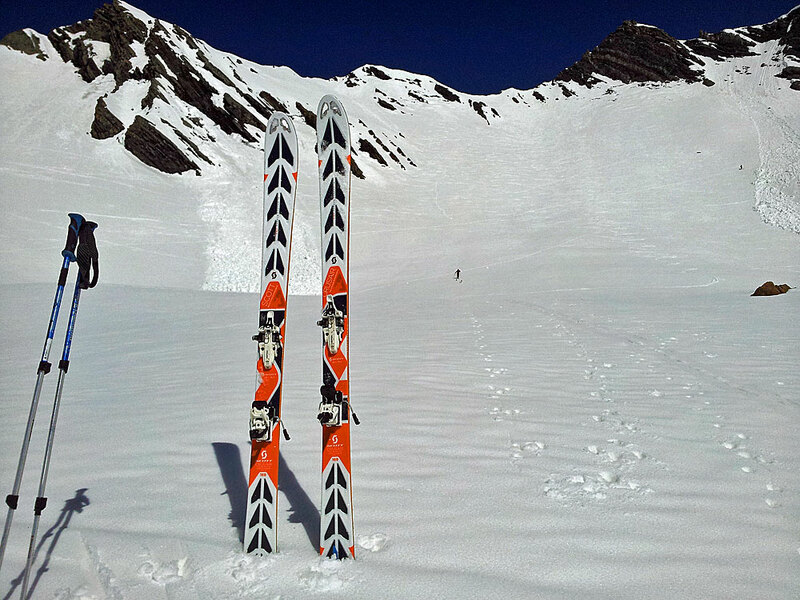 Saturday was sunnier than expected so we went up to see what was going on and so I could take out my new Nordica Santa Ana 169s for Winter 15/16 which I tested in Kuhtai and have set up with Marker F12 touring bindings and Black Diamond skins. 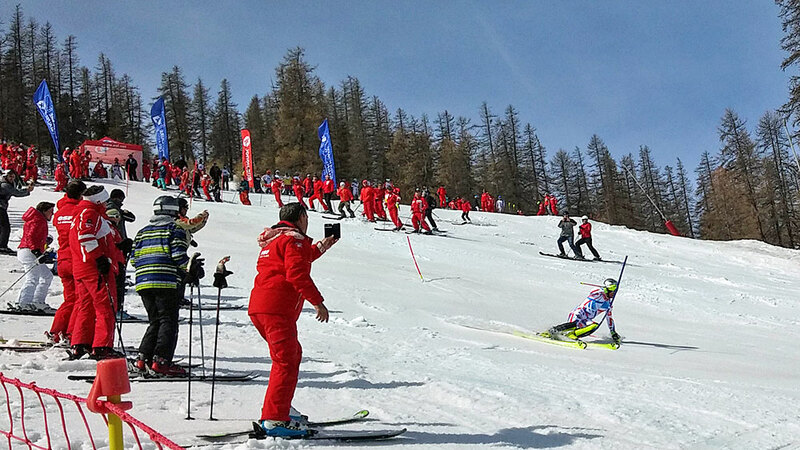 We went over to see the ESF slalom finals where the hill was alive with Red (P)Ants. Boney M was playing loudly over the speakers - the words should have been: 'Ra, Ra, ESF, France's greatest love machines'. 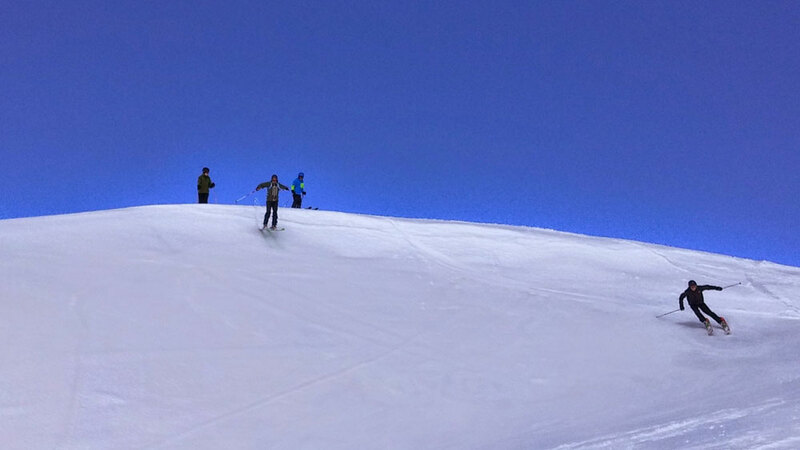 Then we did a few laps of a deserted Draye and Stade Slalom with superb pisted (untracked) snow. Back up Eychauda for a couple of runs as, believe it or not, there was all of two cms of fresh and then we went off the back for what is probably our last slack country of the season. And conditions were still pretty good if a tad sketchy in places! Gav found a nice gulley before the snow ran out and carried on down. I passed on following as the climb back was fairly steep and it was a case of paying dearly for those extra turns. Meanwhile, the marmots were in Disney mode and fine whistle, peeping out of their holes and running around the snow while we climbed back up. 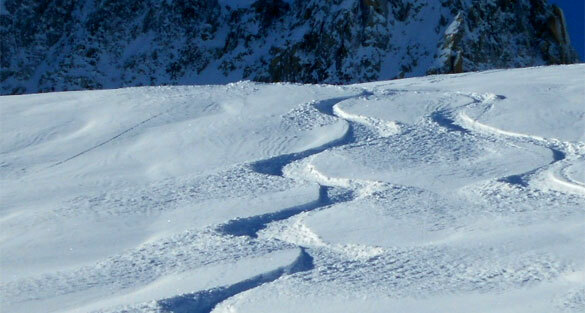 Then it was skins off and a slushy deserted descent to the Frejus lift. 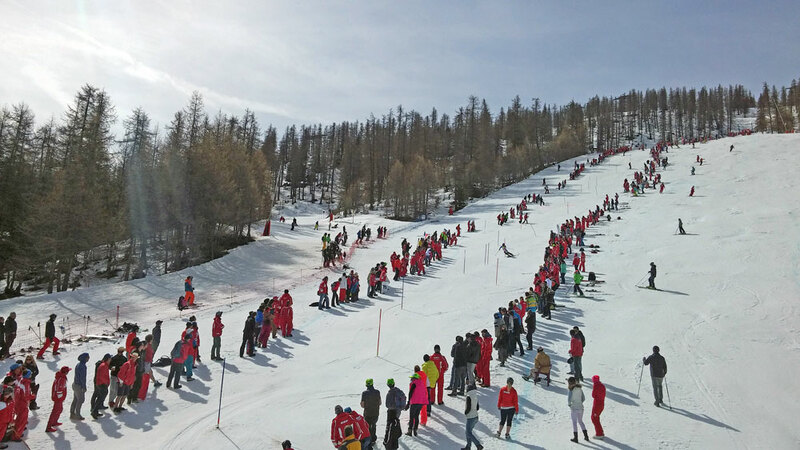 Meanwhile, the resort is swarming with Red (P)Ants as the 3000 or so ESF instructors partake in the 65th Challenge Des Moniteurs in Serre Che, the finals being today. 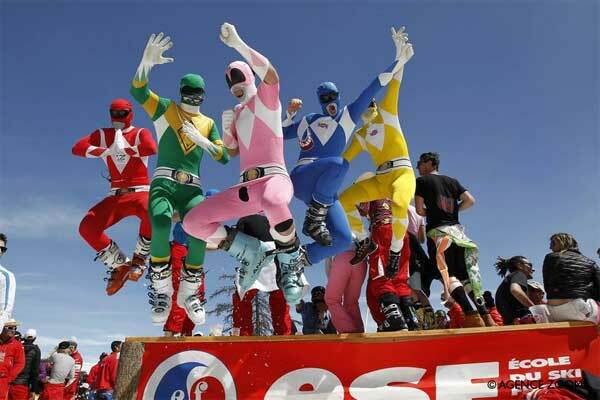 So panda eyes are everywhere along with swishy hair - and the occasional Pow Ranger. Not the most exciting day to wake up to! Very gloomy grey day but warm so not great for anything on two planks or wheels. Probably because I brought out new skis with me and have just had touring bindings mounted and skins cut! Yesterday, though, was pretty sweet. Following Gav's Hike and Ride plan of going over the back from the top of Eychauda from along the ridge towards Yret. 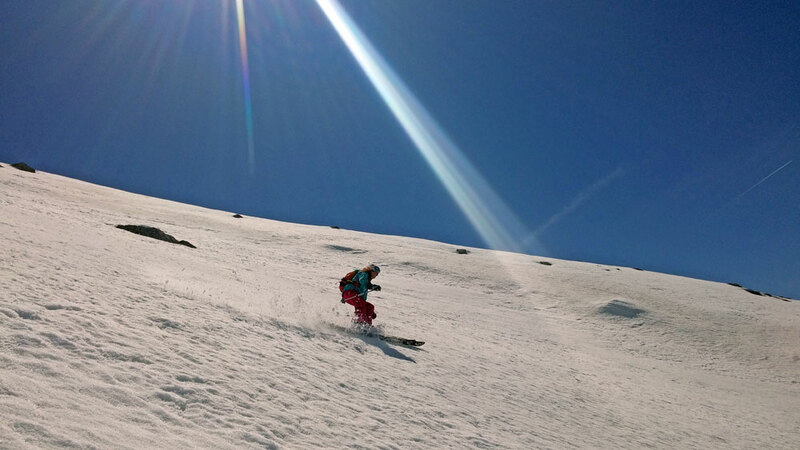 ...and ski down again the steep and quite rocky face to hit sublime spring snow. 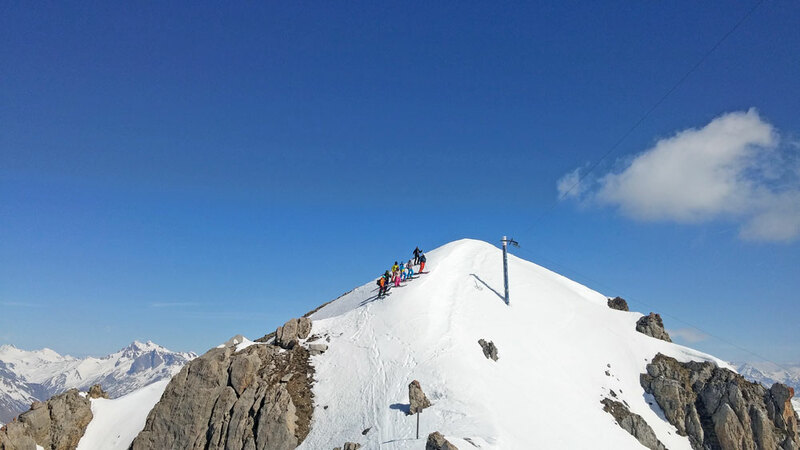 We then boot-packed up 100m and skied over to the Cucumelle lift. WEDNESDAY, 15th APRIL, 09.00 +6.0° SUN! I'm back! 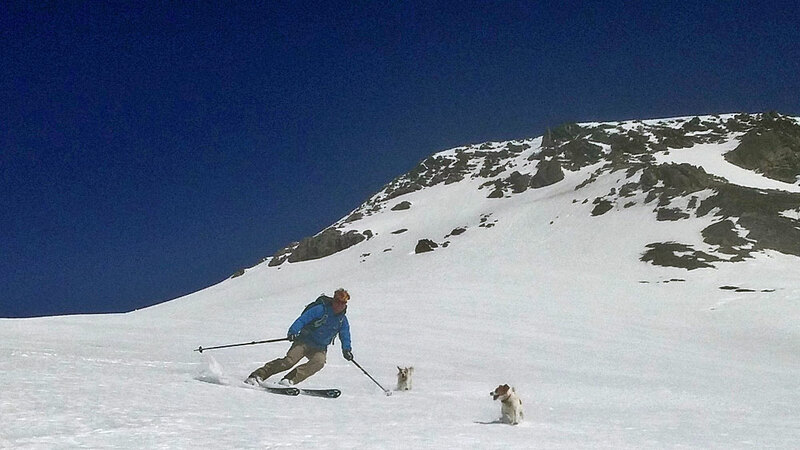 Going for an off-the-back ski, this morning. Might bump into some of the 3000 ESF instructors doing the 65th Challenge des Moniteurs. There'll be lots of panda eye tans and swishy hair! Hopefully haze will burn off. Off to Turin (Turin and not Touring) later today to pick Elaine up and I've worked out a little climb that could be challenging! Yesterday, I went back up the hill to explore a few options going off the back, and then climbing back up. 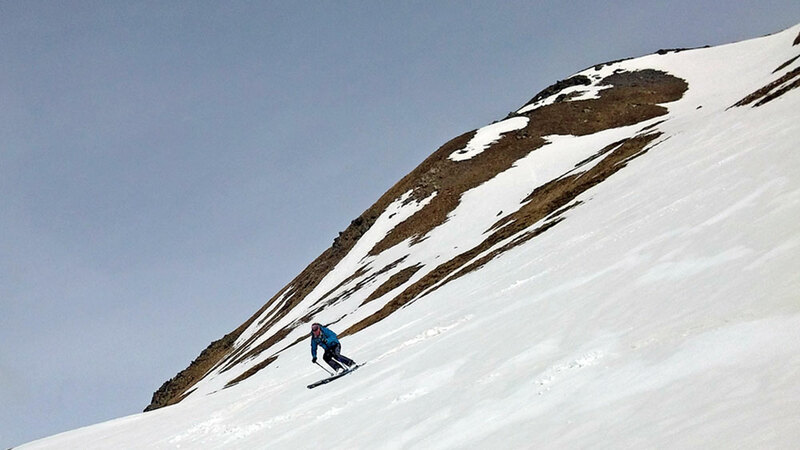 First run was superb as I came off the Gauthier ridge and skied some spring snow before traversing across to below the Col de Mea. 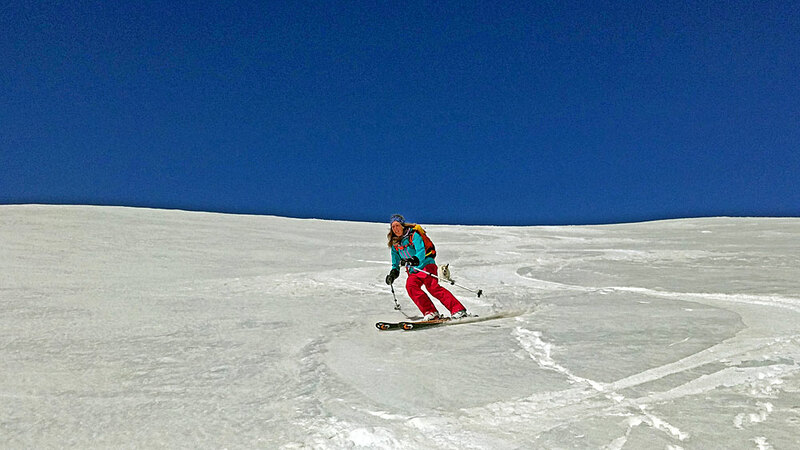 I then skinned back before finally boot packing up the rocks and shale to the summit of the Tete Balme ridge, which was a mistake as my original plan was to ski a line facing west off the ridge and then climb back up to Col de Frejus and the Cucumelle chair. This time of year it's all about timing and the slope I chose to ski down had been in the sun too long and had warmed up so I was more than a little concerned that it might go with me on it, not at all clever. I would have been better waiting for half an hour or so and skiing the west face that would have started to transform nicely, so lesson learnt and now know what to do. Just as well Elaine was not with me. Mind you, she would not like to have climbed the exposed ridge! Came off the traverse track you can see left of picture skiing down face in the middle and then climbed back behind the ridge right of picture. This is a nice shot looking down over the Col de Mea drags, Clot Gauthier chair middle of picture and Eychauda drag top right. Looks like it's going to be another hot day, ao I might go up the hill soon to take a look at the ESF National Ski Championships and maybe try a new route off the back. As for yesterday, back on the bike and cycled over to Puy St Vincent in glorious weather, then back in shorts and t-shirt to walk the dogs. Cycling back up the valley I did see a fair number of Brits, Dutch and Belgians driving up maybe oblivious to the fact that the road is closed due to a tunnel roof collapsing, which means a big detour. I think the powers that be could do more to put some temporary signage up warning people. 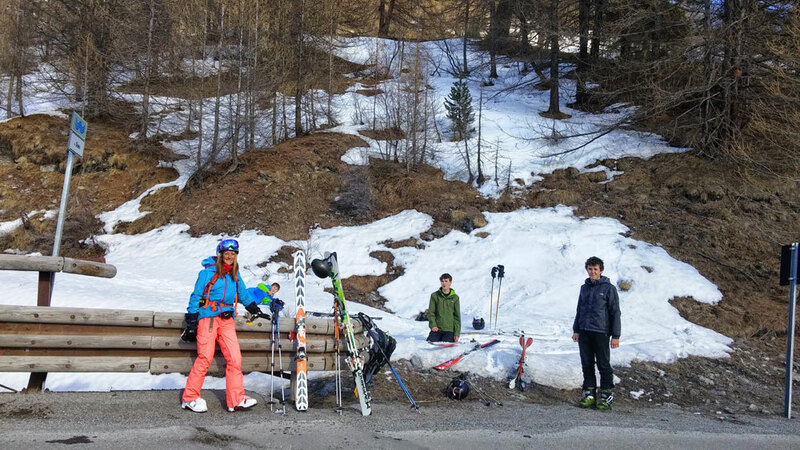 I was invited by Riquet Sport in the village to their 'friends' morning ski and then lunch and a little more, if you so wished. It was reasonably amusing at first as everyone was suggesting where to go and I just followed and within 10 minutes our group was two groups. Pace on the piste was, as to be expected, very fast and a high standard of skiing, again as to be expected. We regrouped about 20 minutes later to do the ridge to hike up and around the Tete de la Balme. Ironic in that I had never done it before and now twice in four days. 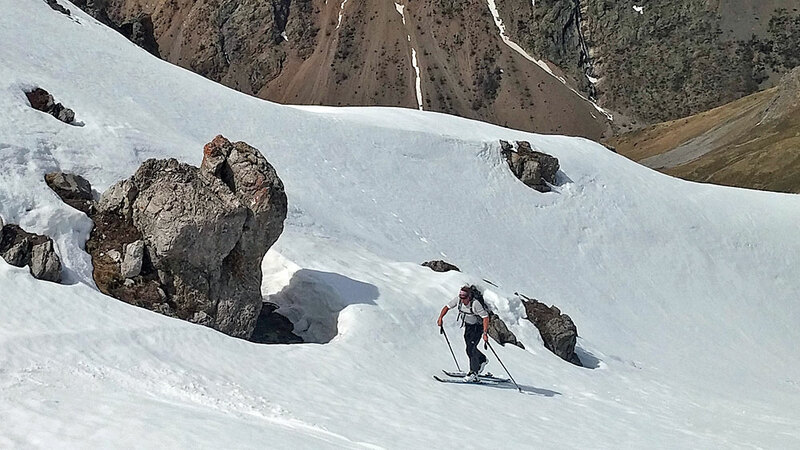 We continued to try and ski spring snow, and I was sort of relieved that I did not end up skiing any lines that I did not know about. Though, for sure, with decent snow I would have been doing stuff I'd never done. Then back down to Aravet for some water skiing and BBQ. Luckily there was no pressure in the group to do it - and I took my role as cameraman very seriously ;-) The local young Freestyle dudes were really going for it, all with Charlie mustaches. 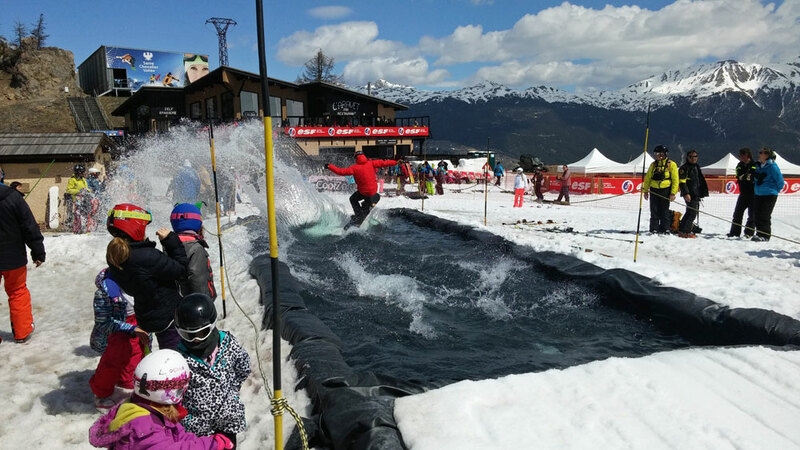 I've been hearing how next week is going to be bonkers busy with 5,000 ESF instructors letting their hair down at the end of the season for the ESF Ski Championships. Evidently it can get very messy. All the bars will be serving drinks in tough plastic glasses (that you pay a euro for), buses running the length of the valley till 02:45 - so we might have to take advantage of those to go out in Briancon next week! Panic in Serre Chevalier as the main road is closed just after La Grave due to a rock fall in the tunnel du Chambon, just up from the dam, and it's not known how long it will take to open! And although it's relatively quiet here, there are many Belgians and English on the last week of their Easter holidays, so it will mean a big diversion via Gap or endure the expense of the Frejus tunnel. On the positive side, it could be good for an empty La Grave if we get Ja'vril but forecasts looking bleak on that front. 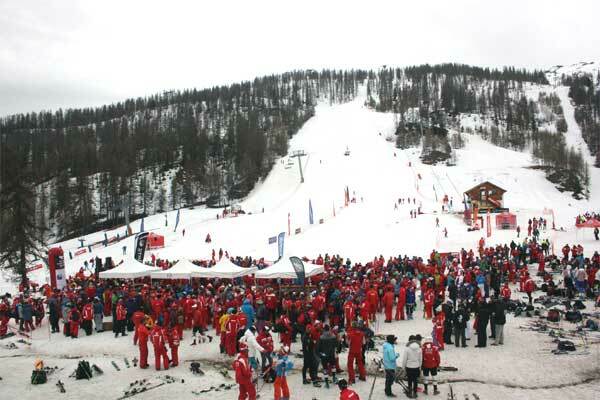 Here in Serre, next week, we have the ESF National Ski Championships which will mean many a piste will be closed. I could well be out on the bike today, just hope it stays dry as forecast is for rain later on. Elaine was off to Turin, yesterday, but not before we did some more t(o)urin' up in the Galibier sector with the Rando Chiens. 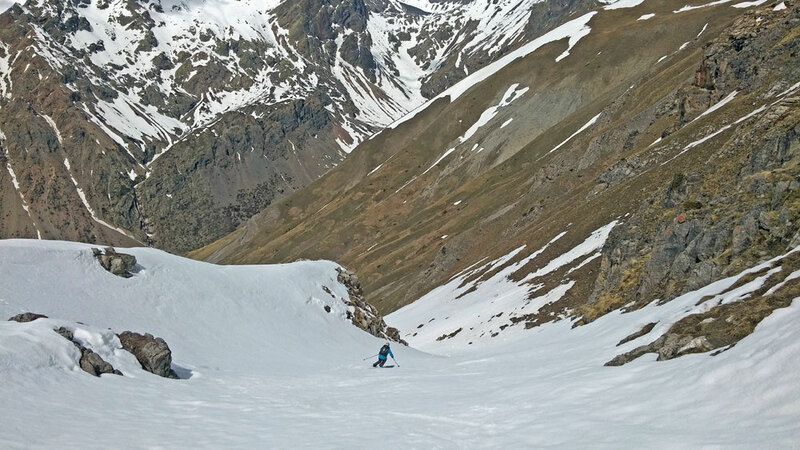 We opted to go again up the Vallon de Roche Noire and take a similar route up to what we did a couple of weeks back with Jes and his two sons. On the way up I was looking at a face below Pic Blanc that I thought should be accessible from where we climbed up to recently. 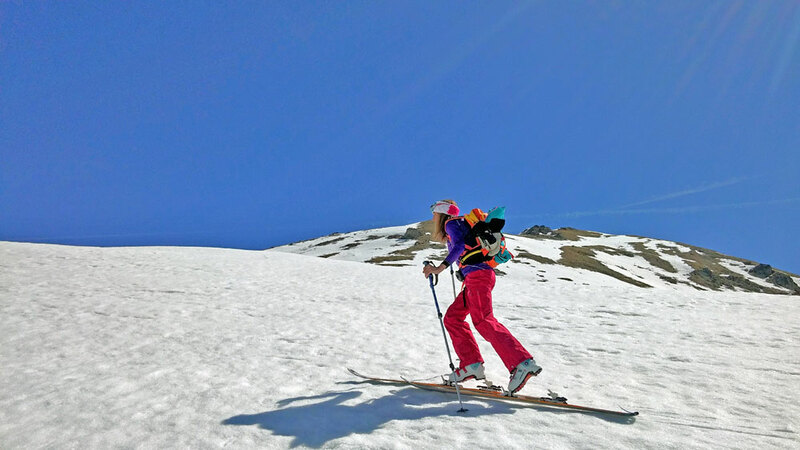 So, rather than ski the same route that was basically going down where we came up, we traversed across and descended down in superb untracked spring snow, with Elaine commenting that it was probably one of the best descents of the season. Result! Rando Chiens loved it with a couple of sightings (chasings) of marmots and, also two chamois above us. And I have never seen one on the snow pack where it had dug out its burrow and was whistling above the entrance before Beanie shot up there! Once back down temps quickly rose and we stopped for pizza at the excellent Mamma Mia just by the old town prior to driving to Turin. We didn't think it would freeze last night but it's looking good for a morning ski tour over at Galibier with Rando Chiens before going to Turin airport where my flight to UK is already delayed thanks to French air traffic control stike. Merde! It turned out a lot warmer, yesterday, hitting 17C in the afternoon. After dinner with friends, the night before, cooking the extra turkey crown we brought over for Christmas (thanks to Mojo's deep freeze), we decided to have a later morning and repeat the Crete de Roche Gauthier hike where the old Balme chair finished. On the way, we came across a large UPCA group of off-piste pillagers going up Cucumelle but not sure what they were expecting to score? 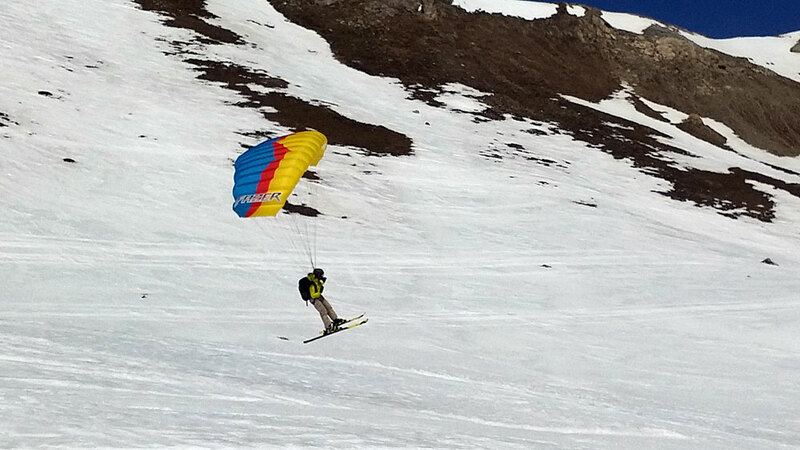 Then we were joined going up Tete de la Balme by two guys speedflying from the top (although they didn't quite have enough updraft to get much height) but such a cool way to descend. Second hike was just as good on the descent with spring snow - Gav was exceptionally proud of his Germanically neat ski tracks. It's so slushy and muddy down via Club Med that getting the Pontillas gondola is now a seriously sensible option. And, ditto, weather today as the last two days. Though, maybe, a tad warmer. A first for Gav, yesterday, in Serre Che. 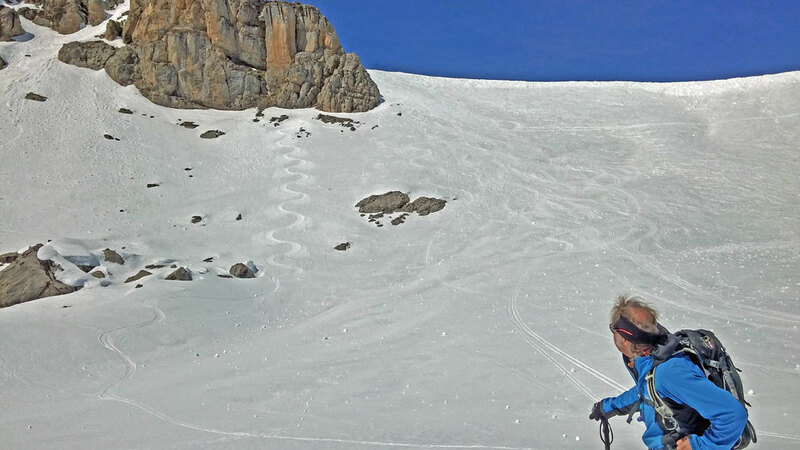 We repeated our usual run off the back of Yret and skinned back up to the Cucumelle chair - and it was pretty brilliant spring snow all the way. 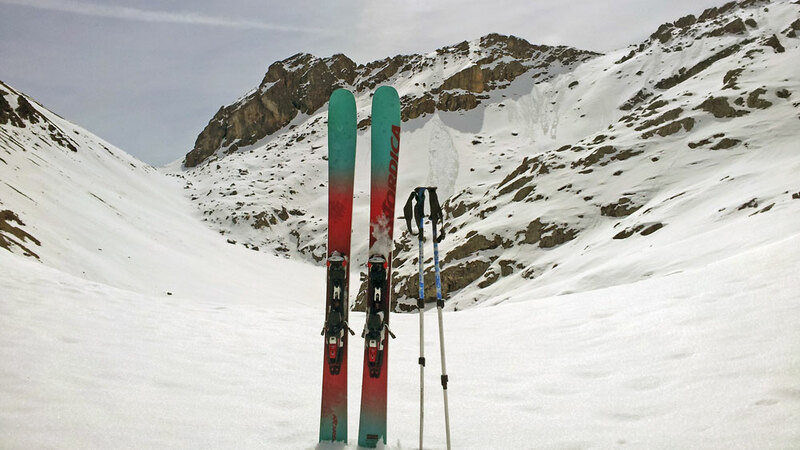 We then hiked up the Crete de Roche Gauthier to where the old Balme chair finished. 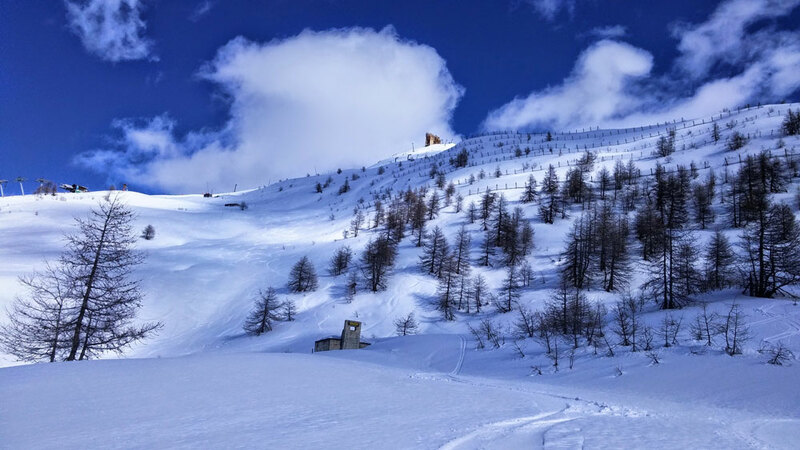 I skied the spring snow down where there used to be a red run before they removed the chair (far right of the Tete de la Balme in the photo) while Gav climbed up around the ridge (tad gnarly) of the Tete de la Balme and had the alernative (left in the photo) descent down. Almost the same temperatures and sun as 24 hours ago. Sooo it's Eat Sleep Ride Repeat - doing the same as yesterday as it was a plan.that really came good going over the back of the Yret chairlift and down for 2k and 700m vertical in perfect spring snow. 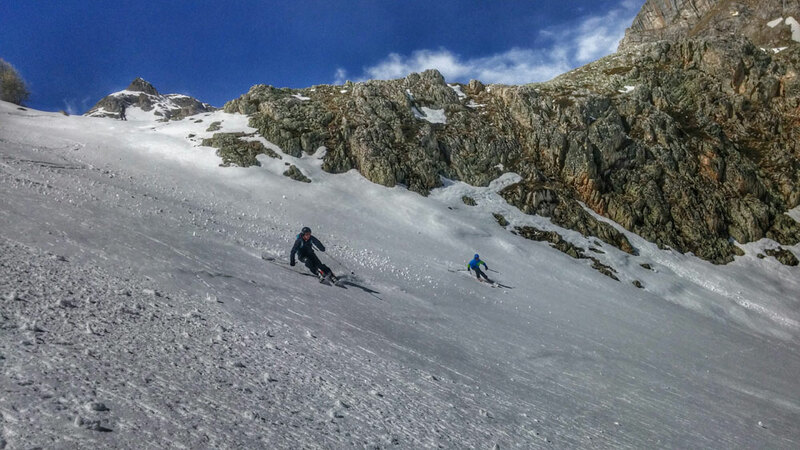 It was still a tad icy skinning up, hence Gav decided to straight line it taking just 20mins and hitting 175bpm! 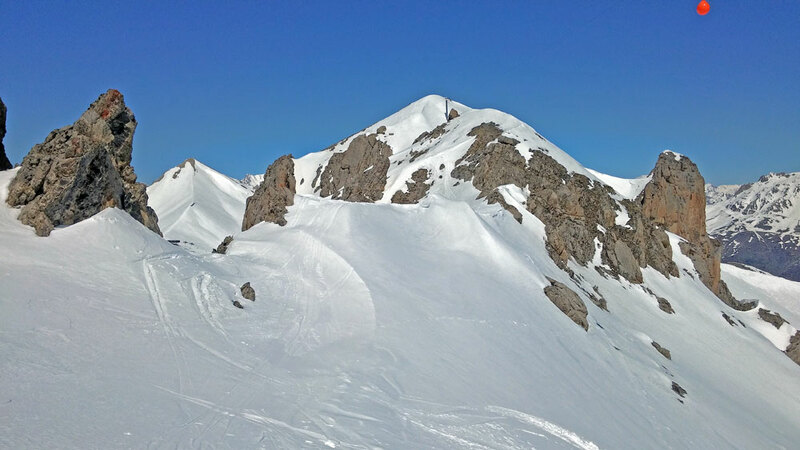 Also plan to hike the ridge at the top of Vallon and descend via the old piste on the other side.. 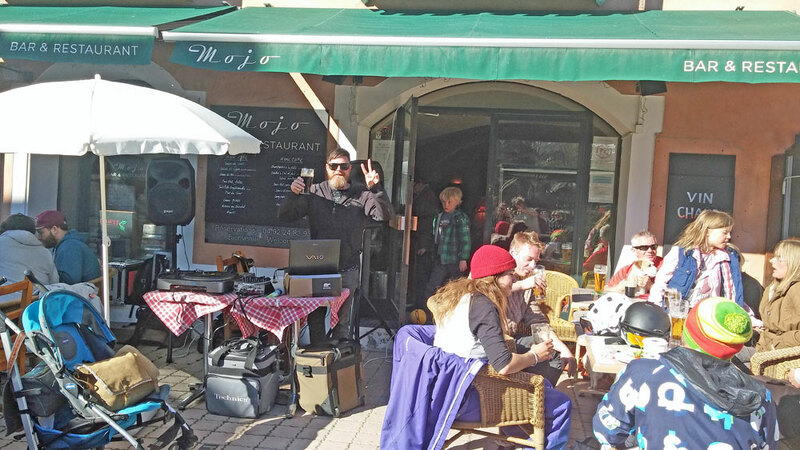 It was also Serre Che's one and only Mojo's BBQ, yesterday, run by Tim and Mel whose views of Serre Che feature in our Friends In High Places. 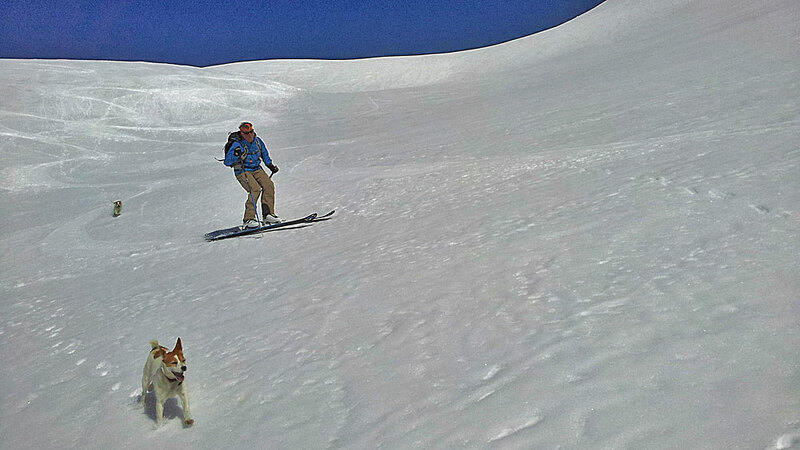 While I took the dogs for a run (training for Brighton on 12th April) as it didn't look perfect spring snow weather, yesterday, Gav took the Sloan gang (Andy and his three boys) up the hill in Serre Che and found surprisingly good snow with a few cms of fresh and spring. 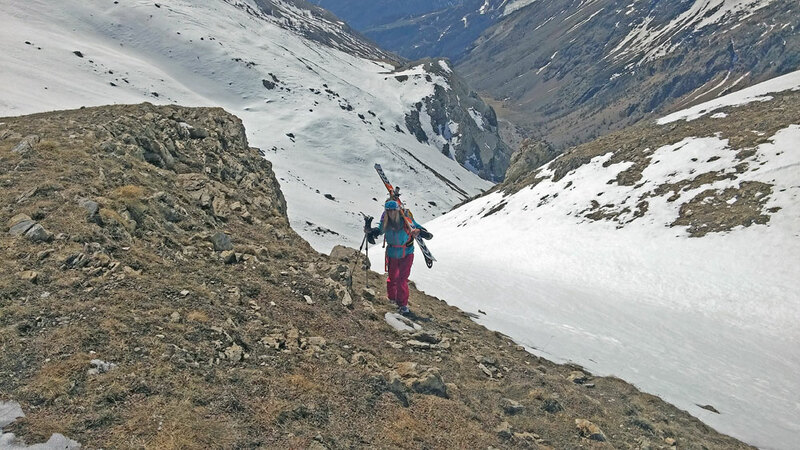 They took the long traverse from the top of the Vallon lift to score good lines and then went back over the top of Eychauda and Gav's new route via Lac des Partias to Les Combes where, cunningly, Gav had parked the van. Very, very light dusting up the hill. Warm night and cloud, this morning, so it's not quite classic spring touring weather. Yesterday, though, was perfect. 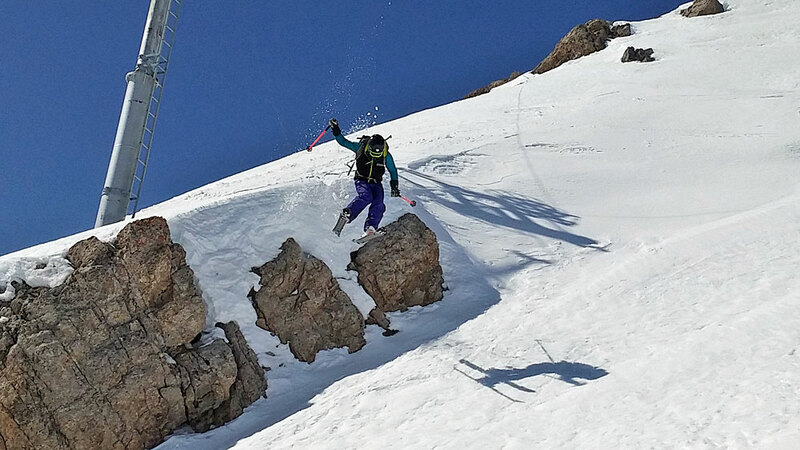 After two days of howling winds, the probable cause of two more local fatal avalanches (see News On The Hill), the wind dropped and the sun came out. 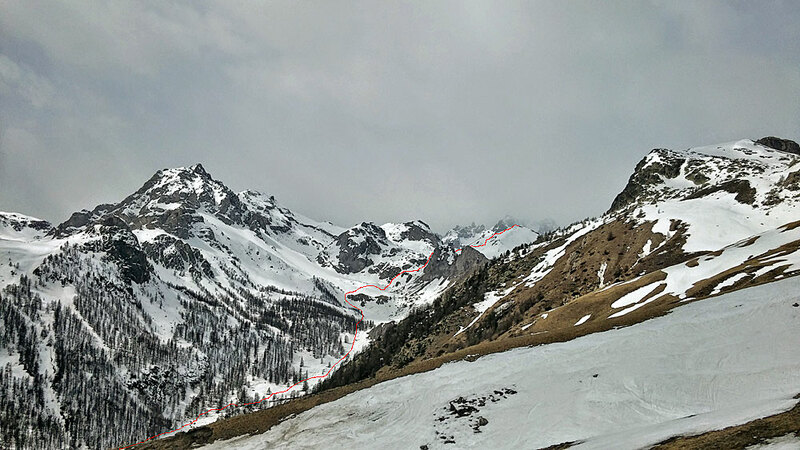 So taking Paul, who is new to ski touring, we went over the top of Eychauda and took Gav's new route over the back via Lac des Partias (see red line below). 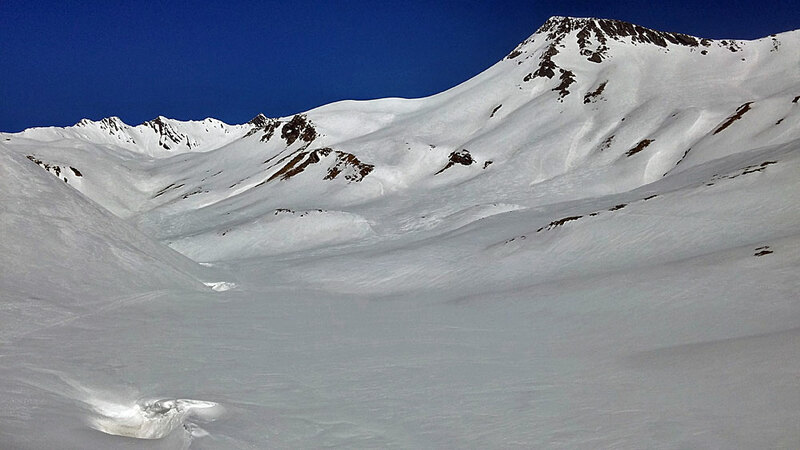 It was sublime spring snow all the way down with a few gnarly rocks to negotiate en route. Going back up, though, meant part skinning and part boot packing over mud due to lack of snow. Fortunately, the Rocher Blanc chairlift WAS open at the top even though the only run down was, mostly, just a narrow ribbon of snow. After a hot chocolate we made our way back via the lifts, coming down to Pontillas at around 15.00 when water skis would have been useful in the slush! Sun and so much warmer, this morning! And, hopefully, the wind that's been howling and closing lifts all around the mountains over the past two days, has eased. 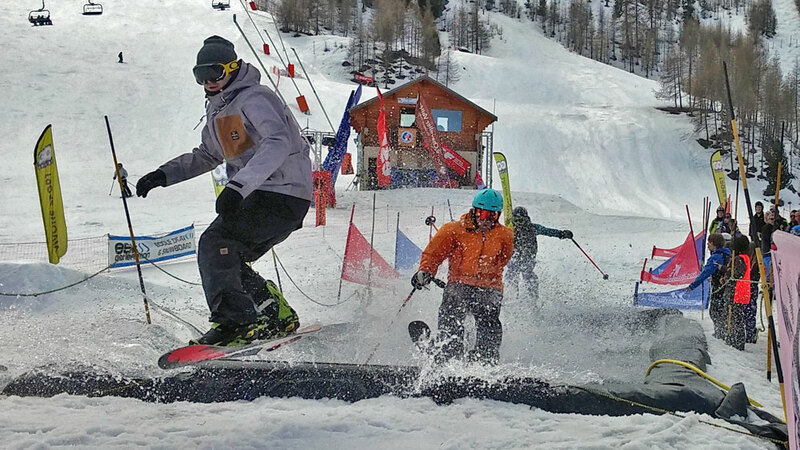 Ir was another road trip to Italy, yesterday, with Andy Sloan and his boys, Callum, Max and Finn. 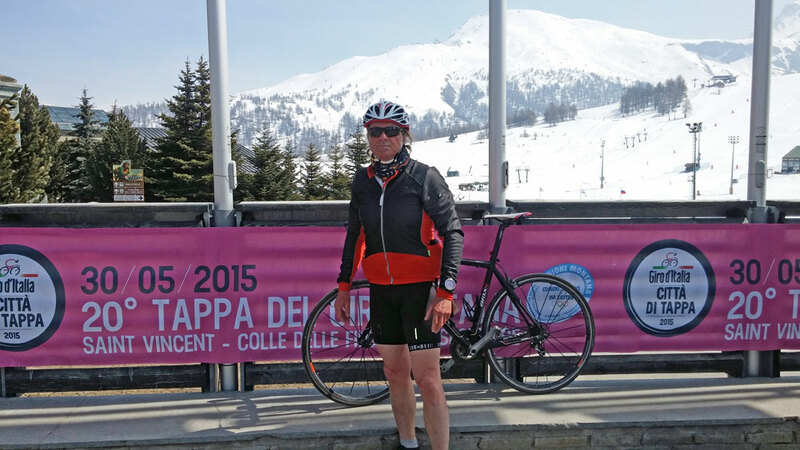 But, owing to linking lift closures in the wind, we got our lift passes at San Sicario but drove on up to Sestriere. So it was around 11.00 when we took the chairlift - and went straight down off piste through the trees. The snow hadn't even thought about transforming - it was still hard and icy. But the boys (and I include the adult ones!) were all gung ho and hungry for more. As the day progressed we found more and more spring snow, only touching the piste to get to the chairlifts - and, then, Gav had the genius idea to do a road run and drive one of the vans to a back road below Sestriere (that he knew from cycling in the summer) so, at the end of the day, we could ski all the way down to the road. With a short boot hike as the key chairlift was closed, we were high enough to traverse off the back. As it was around 16.30, the spring snow was perfect (see above) and, apart from avoiding low tree branches and grass, it was sublime all the way! WEDNESDAY, 1st APRIL, 09.00 2C SUN AND WIND. AGAIN! If we were by the sea, it'd be perfect for kite/windsurfing! After a day of high winds in the Alps, yesterday, it's ditto again, today. Maybe, not quite so strong winds but they were winching in the gondolas at Pontillas, here in Serre Che, this morning. So our Plan A, to go over the back of Eychauda, was scuppered. But going kinda stir crazy indoors, we decided on a Plan B to see how windy it was - and the snow conditions - over in the Galibier area. 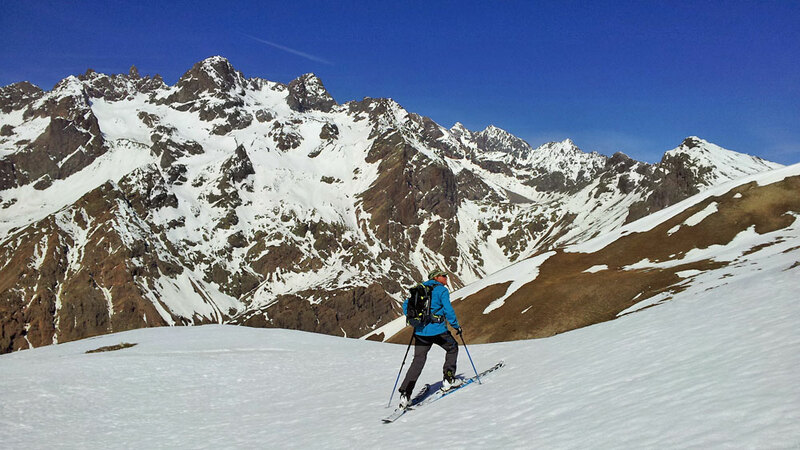 We took a seasonaire friend, Paul, who is keen to do powder and off-piste and broaden his horizons, literally, by ski touring. 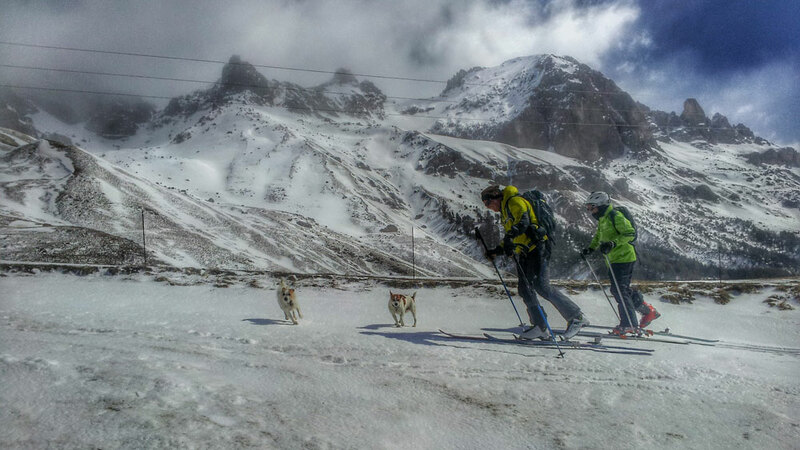 So, if all else failed re wind/snow it would be a good exercise for him to get used to touring kit (boots hired from Riquet, skis/skins leant by Gavin) - and good exercise for the Rando Chiens, full stop. Well, all else did fail. The wind was howling AND cold. The snow was hard and icy even at road level at 10.30am with blue skies, except for windblown stashes - and the safety of the windslab was questionable. 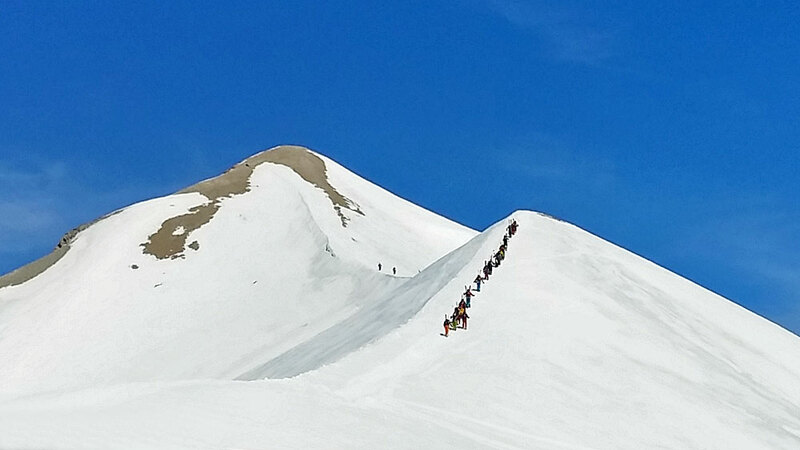 Just a handful of tourers were out on the mountain. 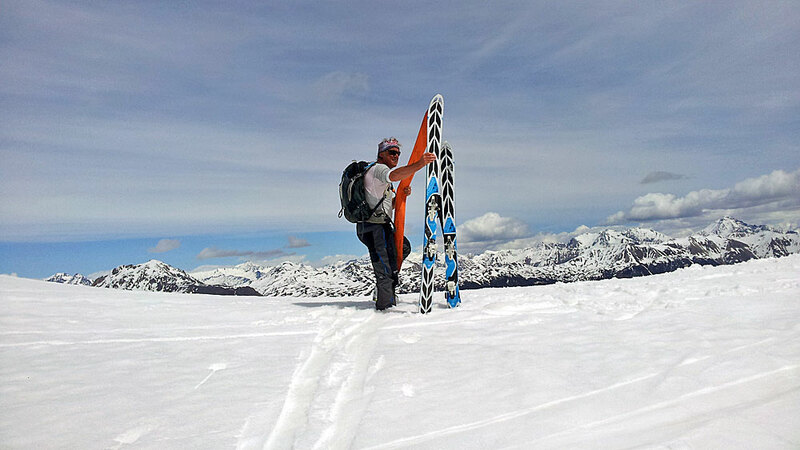 But Paul did get to try out his kit, experiencing taking flapping skins off in a gusty wind and clipping into tech Dynafit bindings on an icy angle. And the Rando Chiens had a fun run, one chasing a snowball that slipped down and down the slope we'd come up for around 150m vertical on the ice and, for the other, a half mile full tilt chase on the scent of what turned out to be a rather large bouquetin that sent her haring back to us. 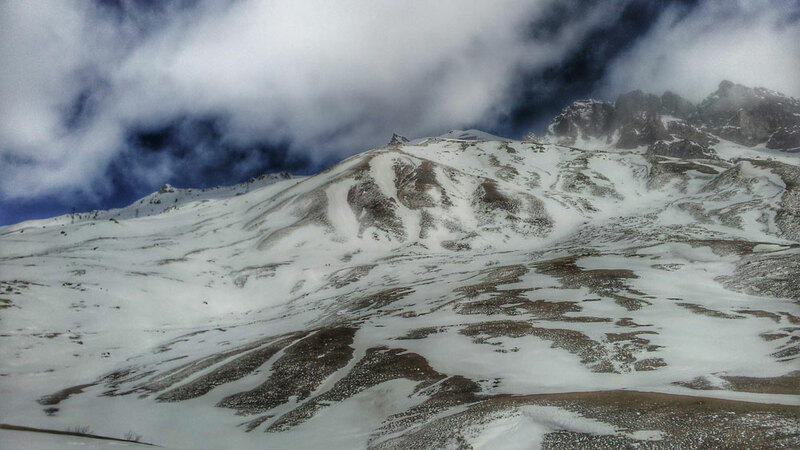 This is the view (below) up to Galibier and the sketchiness of the snow cover. 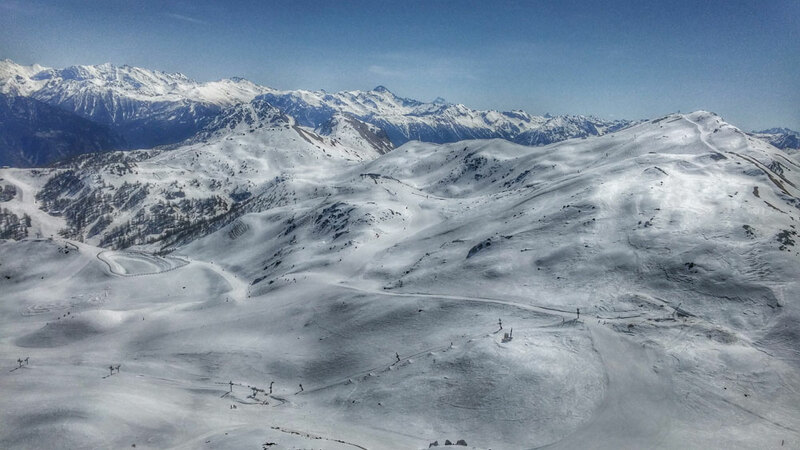 Meanwhile, yesterday, while lifts closed in many resorts and the snow is getting sketchy here in the south, there was early morning powder in the Northern Alps which turned heavy in the warm temperatures. 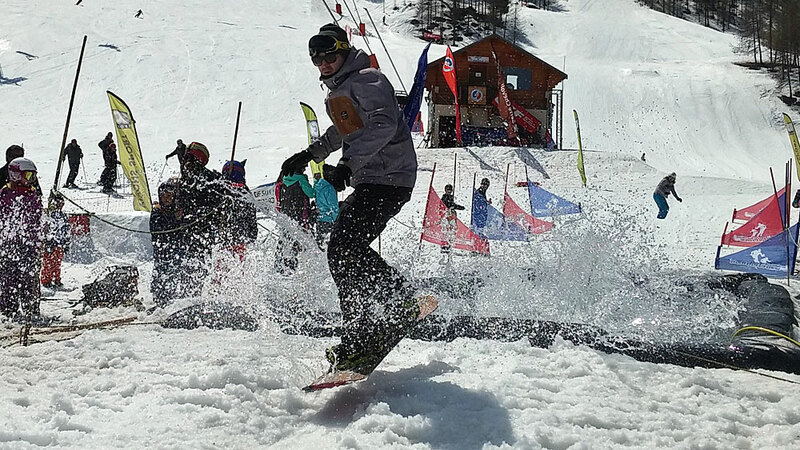 In some Italian resorts, there was light powder and spring with good tracks to be had in Montgenevre under the lifts on a first run (pic courtesy of Andy Sloan).